Has the baseball world been turned upside down? 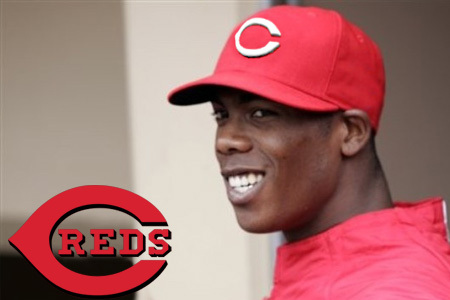 The Major League’s most coveted foreign import free agent, Aroldis Chapman, finally agreed to a five-year, $30 million dollar offer over the weekend! The offer came not from the big money spenders (New York Yankees, Mets or Boston Red Sox), but by the Cincinnati Reds. Equally surprising, the Cuban defector’s runner up in bidding was the Oakland Athletics! The deal is exceptionally well suited for the Reds who look to be cutting their payroll from last season’s roughly $73 million in contracts. Chapman will have little to no effect on this purging, as his complicated contract only includes up to $2.5 million for the first season and $3.5 million for the next two. This relatively inexpensive investment should certainly pay dividends, if for nothing more than just exciting the Reds fanbase who last year had their lowest attendance in 23 years. Many scouts consider the 21 year old Chapman the world’s best left-handed pitching prospect, and anticipate he will be joining the Reds’ rotation sometime within the next season. The problem is, most scouts don’t feel he is ‘Big League ready,’ so the majority of the 2010 season will likely be spent working on control issues in the minor leagues. Fastball – Chapman’s fastball is typically clocked in the 93 – 96 range and will occasionally touch 97 – 99. The pitch has tremendous life and carry through the zone with some natural tail. Chapman’s control will vary from start-to-start. On average, his control of the pitch is decent and will often be at least around the strike zone. But commanding the pitch is a different story. Pitching to a right handed hitter, the catcher’s mitt might be positioned on the inside corner and Chapman’s ball will often end up right down the middle. Curveball – A good change of pace offering with a solid two-plane brake. However, Chapman will sometimes slow his arm down when throwing the pitch. It’s clocked as low as 69 mph, getting as high as 75. Slider – Chapman’s most effective off-speed offering…I’ve heard the pitch can hit 90, but I’ve only seen it come close to that mark once and I’m still not sure the pitch was a slider. I’ve typically seen his slider in the 79 – 83 range. The pitch has major consistency issues and can rate anywhere from below average to plus. Change-Up and Cutter – Chapman possesses both a cutter and change-up, neither of which he uses often. Chapman’s release point is inconsistent and it will vary with each pitch type . . . Chapman has to coordinate a lot of moving parts however, and that will naturally lead to an inability to consistently repeat his mechanics though he has the athleticism to do so. Aroldis, who is most commonly compared to Hall of Fame shoe in – Randy Johnson, has the potential to be a top-end starter on many rotations and at the very least a quality middle reliever. With the recent success of young Cincinnati starters Edinson Volquez and Johnny Cueto, he could eventually become a solid number 3 or 4 starter behind Aaron Harang in the next couple seasons. The Reds pulled of a phenomenal deal here! It will presumably solidify the back end of their rotation in the coming seasons, or could certainly strengthen their aging bullpen that includes Fransisco Cordero and Arthur Rhodes. This move alone bolsters the Reds staff to the point I consider them the 2nd best pitching staff in the NL Central, behind the St. Louis Cardinals, earning them 4 X’s for this deal.